Electric Applications chose Nuvation BMS™ to manage their 960 VDC 1 MW / 1 MWh grid-attached energy storage system. This lead-acid energy storage system was installed by City Utilities in Missouri. The system was part of a pilot project to provide additional energy to the grid during peak demand periods. The system demonstrates various operating modes required to support City Utilities' grid operations. In load shifting mode, the battery begins a cycle at full charge. It discharges during periods of high power demand and charges during off-peak periods, to be ready for the next on-peak discharge cycle. 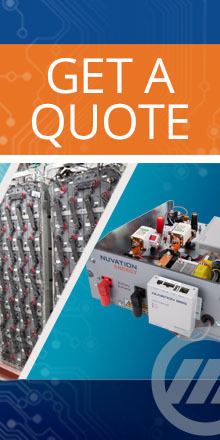 Electric Applications selected Nuvation Energy for the job because Nuvation BMS has a dedicated module for 12 V lead-acid monoblocs. Nuvation BMS also has the ability to provide current and voltage monitoring, as well as State of Charge (SOC) calculations, which the client was looking for.